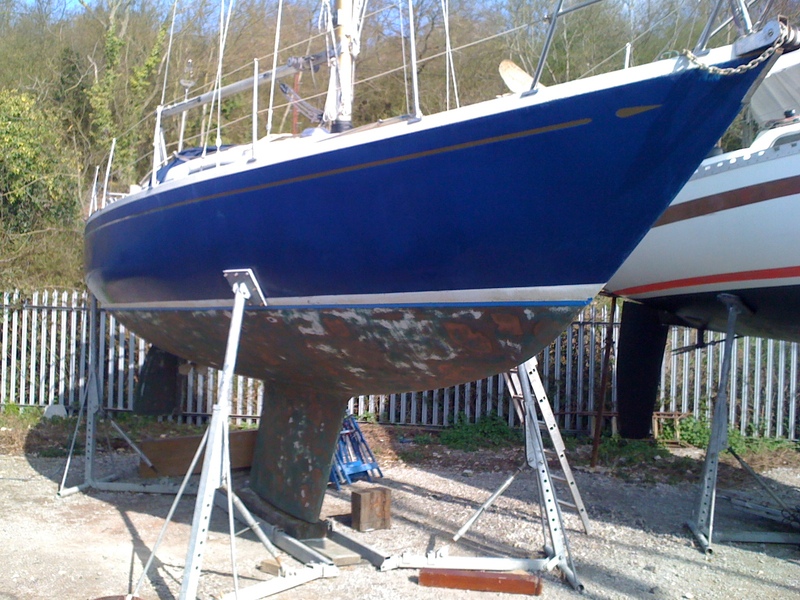 When I purchased the boat she had Coppercoat on her bottom, to which I heaved a heavy sigh, having been accustomed the yearly application of tried and tested antifouling. The Coppercoat had obviously been on for a number of years (well over ten I should imagine), and had began flaking away from the hull where she hadn’t been keyed properly on initial application. 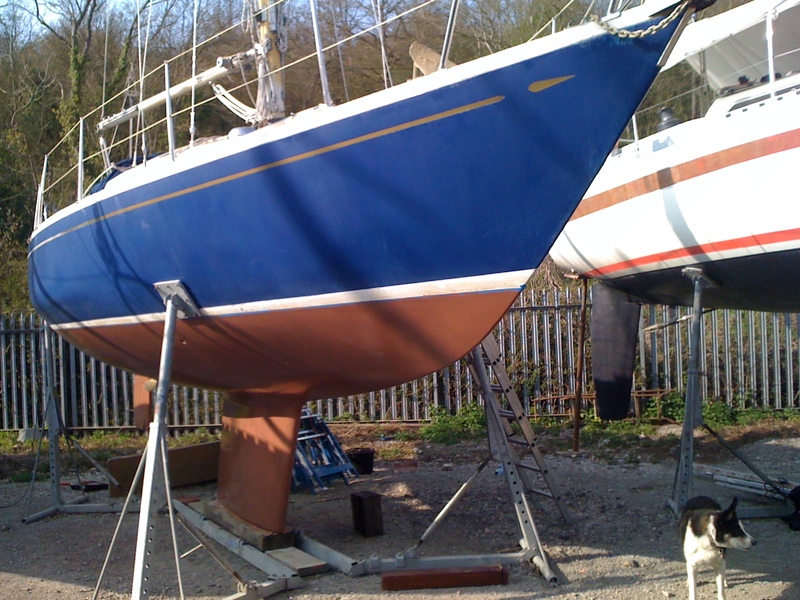 Before we sailed her back to the Medway in 2008, we bought a single ‘unit’ of Coppercoat to sand down and patch up the bits that had flaked away. Each year we lifted Triola out, we abraded the Coppercoat with fine sandpaper, which we thought was the correct process to expose fresh Copper. Subsequently, by the fine fellows at Coppercoat, we were told this was a bad move – the sandpaper would give a rough surface for all the sea denizens of the Medway to cling desperately on to. In addition to this, it thinned down the Coppercoat until we could see the gelcoat underneath starting to show through – not good! At 2010s Southampton boat show, I decided it was time to invest in renewing the Coppercoat and had a marvelous chat with the guys at Coppercoat who did us a good deal on the seven units I would require to do the whole boat, including rollers and thinners. In early 2011, I got to work sanding back the old Coppercoat. 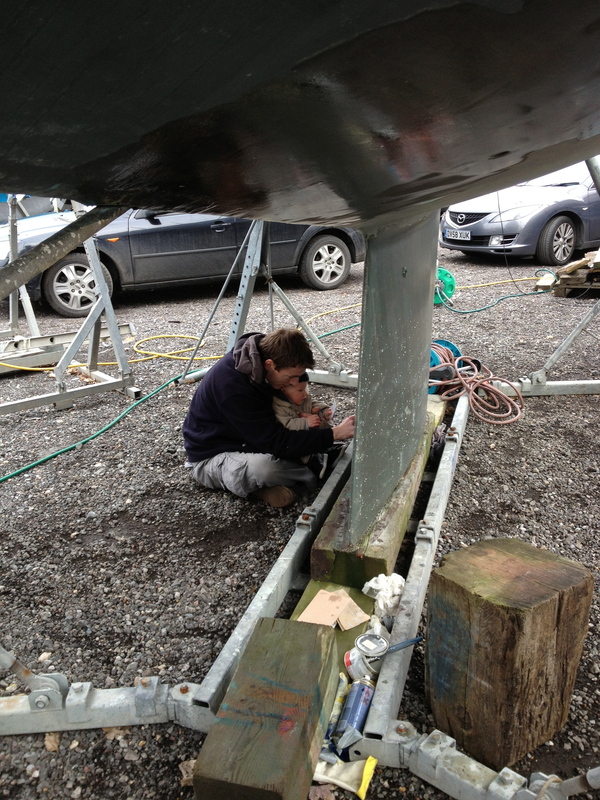 After this it was a waiting game for the correct temperature to apply the new Coppercoat – ideally above 15 degrees! I also knew the dew point was exceedingly important – a single drop of water running down the hull would strip a line off of the Coppercoat. Luckily, a day with a good forecast, and temperature high enough arrived (just a week before my son was born in fact! ), and all six coats of Coppercoat could be applied. I missed the part of the instructions where it said I needed to ‘burnish’ the surface of the Coppercoat to ensure the top layer of epoxy had been removed to allow the Copper to reach the surface. Another mild disaster, as fouling was very bad the next year. Furiously, I approached the Coppercoat stand at 2012s Southampton boatshow and were very helpfully given a red Scotchbrite, plenty of good advice and told to get to work and all would be well. They also had to put up with a barrage of emails from me asking their advice so I would recommend them as a company wholeheartedly, great customer service. In 2013 before launching we burnished the whole hull and since then it has been a resounding success. We now keep the boat in Chatham Marina and we get almost nil growth. It certainly looks as though you’ve made a nice job of it Mark. The first treatment of Coppercoat on this yacht performed well for a good 10 years or so and I see no reason why this second treatment should not do likewise. This treatment of Coppercoat has to make more sense than repeated annual applications of old fashioned ablative paint. Thanks for all the assistance and all those emails flying back and forth – glad we went with the proper brand and looking forward to many years of zero maintenance (and cost) to below the waterline! Hello Emil, for Triola we purchased 7 litres, however, I pretty sure we only used 6 of the 7 packs! Its been really good and its worked really well for us. If you have any questions about it, Ewan Clark at Coppercoat (info@coppercoat.com) was very helpful indeed and answered the many questions I had.